Arrival Iceland, transfer to Reykjavik. If your flight lands early in the day, a great suggestion is to explore Reykjavík, the largest municipality in Iceland. Overnight stay in Reykjavík. Breakfast at your hotel. Begin the day with a short orientation tour of Reykjavik. Drive along the scenic coastline of Hvalfjordur Fjord, one of Iceland‘s longest and deepest, on the way to Glymur. This is Iceland's highest waterfall, which descends gracefully in streaming ribbons down a 200-metre (658 foot) drop into a massive canyon adorned in lush, green moss. Both the fjord and the waterfall are linked to a local legend about a mythical whale that swam up the waterfall into the lake at the top. Eerily enough, whale bones have been found here! Spend some time hiking in the area to enjoy different views of the waterfall and surrounding nature. Dinner and overnight stay in the Borgarfjordur area. Breakfast at your hotel. Start the day with getting to know beautiful Borgarfjordur on a refreshing hike. 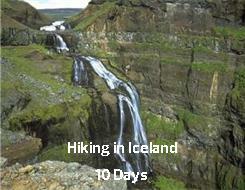 The hike will visit Glanni, a multi-tiered waterfall rumoured to be a home for elves and trolls. You will then visit the 3,500 year old Grabrok crater, which has hiking trails taking you to the top of the crater for for remarkable views over moss-covered lava fields.. Continue your scenic journey as you cross Holtavorduheidi plateau, the gateway between North and South Iceland. Head to the Vididalur Valley and its rushing river. Here you will hike in Kolugljufri, a lava rock canyon that leads to a hidden waterfall. Continue to the charming village of Hofsos and take a short stroll down to Stadarbjargarvik inlet to admire the group of beautifully geometric basalt columns located right at sea level. Drive on to the stunning Tröllaskagi (Troll Peninsula) with its amazing views of mountains and fjords, en route to Siglufjordur, a town within a fjord of the same name. Overnight stay in Siglufjordur for the next two nights. Tonight recharge your body and soul with a soak in the hotel’s geothermal hot tubs. With a view over the harbour and the fjord, the hot rubs are a perfect setting for relaxation. Overnight stay in the Siglufjordur area. Breakfast at your hotel. In the morning visit the award-winning Herring Era Museum, where the harbour atmosphere of the early 20th century is brought to life in three historical buildings. Today’s hiking focuses on exploring a local favorite spot: Siglufjardarskard Pass. In the old days, a horse trail was created for area farmers to travel over the mountains to Siglufjordur. Today the trail has become a hiking route, yet one that is not often used. You will feel a sense of discovery as you hike through the area. The hike is led by an expert local guide who will base what parts of the trail you will explore based on the experience level of the group and trail conditions. The hiking time also variable, based on group experience. Those who do not wish to participate in the walk can stay behind at Siglufjordur and enjoy a light walk in the scenic areas around the village with the tour group guide. After an active day in the outdoors, visit the home of a local resident for a home-cooked meal of hearty Icelandic meat soup featuring local ingredients. Overnight in Siglufjordur. Breakfast at your hotel. The day begins with a short stop in Akureyri, the colourful “capital” of North Iceland. After some time to enjoy the atmosphere of this charming town, head to picturesque Godafoss, ‘Waterfall of the Gods’. The journey continues to the Lake Myvatn Nature Reserve, a geological wonderland of wildly contrasting nature. With the ominous peaks of Mt. Hverfjall and Krafla volcano as a backdrop, Lake Myvatn has a surprising serenity that is ideal for light hiking. Summertime is peak birding season, so it‘s good to have some binoculars on hand to catch diverse species, possibly even the rare Barrow's golden eye. Take a walk through the imposing Dimmuborgir (Dark Castles) with their rugged stacks of towering rocks. Next, hike up to Mt. Leirhnjukur hot spring area, which is part of the Krafla volcanic area and teems with ancient lava flows and fissures. Afterwards, visit Namaskard geothermal field to view boiling fumaroles and violently bubbling pools of mud. The tour will then make a stop will be made at the Myvatn Nature Baths where you can see how the locals benefit from the geothermal activity. There will be a chance for an optional swim in the warm and soothing waters. Dinner and overnight in the Myvatn area. Spend the remainder of your afternoon exploring the lush vegetation and forested areas of Hljodaklettar. (Hiking time: approximately 3 hours). The day ends with an unforgettable visit to Europe’s mightiest waterfall, Dettifoss, a thundering cascade of glacial water and mist among shattered cliffs. Afterwards, return to the Lake Myvatn area for your overnight. Dinner and overnight in the Myvatn area. Breakfast at your hotel. Today you will head into the uninhabited interior via Kjolur mountain track.This route goes back to Viking times and heads straight through Iceland’s uninhabited interior highlands, passing between the mighty Langjokull and Hofsjokull glaciers. You will see Iceland‘s true remoteness and nature at its rawest. This area of black sand deserts has numerous scenic walking paths along the way, dotted with hidden geothermal treasures and green oases. Your group will stop at Hveravellir, multi-colored geothermal with a natural pool that is perfect for a relaxing break. The Kjolur highland route emerges into civilization again in the Gullfoss and Geysir area, Gullfoss, the majestic waterfall of sparkling mist and golden charm is situated on the Hvita River, which is fed by Iceland’s second largest glacier, Langjokull. The intriguing great geysir area is nearby, a steamy geothermal field of bubbling mud and high-shooting hot springs. Dinner and overnight in the Hella area. A perfect way to unwind is a soothing soak in the hotel's geothermal hot tub and sauna, located in a garden area. Breakfast at your hotel. Iceland’s southern uninhabited interior sets a surreal stage for today's adventure. The uninhabited wilderness of Landmannalaugar and Fjallabak reveal geological influences in volcanic craters, multi coloured rhyolite mountains, steaming lava fields, and the ominous Hekla volcano. There are many beautiful walking trails in the area, and a crater-filled lake lush with brown trout. Enjoy the benefits of this geothermal area with a refreshing swim in and mannalaugar's hot-spring fed river, one of the less frequented but most scenic springs in Iceland. Overnight in the Hella area. Thorsmork Nature Reserve (also known as the Thor’s Playground) should be on every nature lover’s bucket list. This enchanted hidden valley is nestled between two glaciers and protected by rivers and mountains. On the way to Thorsmork, stop at Seljalandsfoss waterfall, where you can gain a different perspective by walking behind the curtain of cascading water. Once within Thorsmork, walk along marked trails in the beautiful scenery of delicate trees and green grass surrounded by towering mountains and glacial tongues. After a beautiful day here, the tour heads to Reykjavik. Overnight stay in Reykjavik.